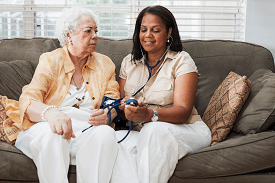 As a dependable homecare provider for more than 15 years, Precise Home Health Care Services is a provider of both skilled medical care and non-medical services for adult and pediatric patients in the comfort of their homes. Our staff is on call 24-hours-a-day, seven-days-a-week, to help ensure continuity of care and preserve quality of life while promoting independence and individual success. Whether you’re in need of short term relief in the form of respite care or a more permanent care arrangement for a loved one or yourself, our caregivers can help make life easier. Below is a list of services we provide.